Windows Presentation Foundation (WPF), formerly code-named Avalon; a new user interface subsystem and API based on XML and vector graphics, which uses 3D computer graphics hardware and Direct3D technologies. See WPF SDK for developer articles and documentation on WPF. 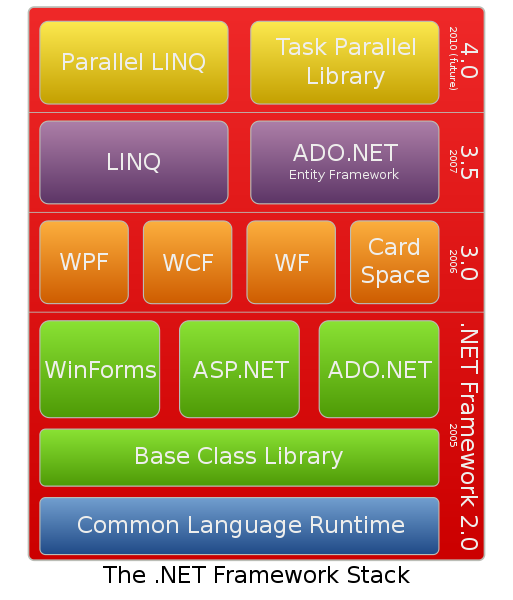 Windows Communication Foundation (WCF), formerly code-named Indigo; a service-oriented messaging system which allows programs to interoperate locally or remotely similar to web services. Windows CardSpace, formerly code-named InfoCard; a software component which securely stores a person’s digital identities and provides a unified interface for choosing the identity for a particular transaction, such as logging in to a website. Expression trees to represent high-level source code at runtime. Enhanced WCF and WF runtimes, which let WCF work with POX and JSON data, and also expose WF workflows as WCF services. WCF services can be made stateful using the WF persistence model. New Visual Basic .NET and C# language features, such as statement lambdas, implicit line continuations, dynamic dispatch, named parameters, and optional parameters.